4pk Armor All Bug Remover Pre-wash Treatment Auto Cleaner Car Wash 16 Oz. Permatex Spray Nine 15717 Citrus Blaster Bug and Tar Remover 17.5 Oz. CarPro TRIX is a strong degreaser, cleaner, tar remover and iron remover for virtually any exterior automotive surface. CarPro TRIX Tar and Iron Remover 500 ml. CarPro TRIX is a combination of Iron X plus special chemicals that remove tar and naphtha base components. 4 Cans FW1 FastWax Waterless Wash and Car Wax Removes Dirt, Adds Shine ! For those tight fit, difficult to reach spots, spray directly onto a terry cloth and then apply. The original FW1 Waterless Wash and Wax. Cleans and protects almost anything, in seconds. Using a terry cloth gently rub FW1 Wash and Wax cleaning wax in a circular motion. CarPro Iron X Lemon Scent 500 ml. Iron X by CarPro is an acid-free, pH-balanced iron remover that decontaminates auto paint and wheels. Your vehicle constantly faces unseen threats. Remove them with Iron X! CarPro Tar X is a glow-in-the-dark bug and tar remover made of natural solvents extracted from orange peels. Tar X safely lifts grease, tar, asphalt, insects, tire marks, adhesives, traffic film. and any other stubborn contaminants. CarPro Spotless Water Spot Remover is a specially formulated chemical cleaner that dissolves the pesky mineral deposits that create water spots on paint, glass, and wheels. CarPro Spotless Water Spot Remover only takes minutes to apply! The original FW1 Waterless Wash and Wax. Spray on a light coat of FW1 cleaning wax on a small section of about 2'x2'. For those tight fit, difficult to reach spots, spray directly onto a terry cloth and then apply. CarPro Eraser is an IPA and more! Eraser attracts polish residue and dust better and cleans better than an ordinary IPA. Eraser makes it possible for everyone to get the perfect Cquartz finish. CarPro Eraser Intense Oil & Polish Cleanser is the next level of IPA. Boat Bling HS0032 hot Sauce 32oz, Boat Bling HS0032 hot Sauce 32oz, boat Detailer. This product is manufactured in United States. Fast detailer Specially formulated for your boat. Removes hard water spots without removing wax. Item model number: G180515. Manufacturer Part Number: G180515. OEM Part Number: G180515. Cover Included: Bug & Tar Remover. Use before washing, or as needed in-between washes. Do not let any residue dry on any surface. If you do not know how to properly use clay bar ~ there are many ways to learn on the web. Clay bar is the most economical way to remove surface contaminates. Autocare Easy to Grip Car Wash Sponges Multi-Functional Giant Cleaning Sponges. Autocare Car Wash Grit Guard Bucket Insert Washboard Separate Dirt 1PC 9". Autocare Car Wash Grit Guard Bucket Insert Washboard Separate Dirt 1PC 10". The CarPro Tar X Tar and Adhesive Remover is far more than an ordinary degreaser so don't underestimate just how amazing this product is. To explain why this formula is so advanced we'll start with how it's made. Trending at $18.89eBay determines this price through a machine learned model of the product's sale prices within the last 90 days. 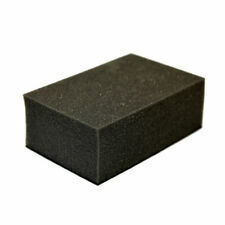 Item: Clay Block - the best substitute for traditional hard to use clay bar. Bug & tar remover. Occasionally check the Clay Block for heavy contaminants that may be stuck onto it. Rinse and rub Clay Block under warm running water before use it again;. Paint Gloss removes dirt, fingerprints, dust and smudges without having to complete a full detail. A water based product for spray application to maintain and enhance paint surfaces on freshly detailed or lightly soiled vehicles. CarPro Tar X is a professional strength tar, adhesive, and bug remover as well as a degreaser that derives its strength from the solvents extracted from orange peels. This incredibly versatile cleaner may be used as a degreaser, tar and asphalt removal, insect, tire mark, adhesive removal, traffic film and more! Apply the clay bar. This is an interesting part of the process. Rub your hand over the car surface before applying clay bar and you will fill small rough spots. After clay bar application and wiping off, the surface will be perfectly smooth. Thick, low-drip formula remains on vertical surfaces for easy cleaning of water spots. New technology chemically embraces and lifts mineral deposits and protects surface from future water spots. Easy to apply and easy to wipe off. Trending at $13.54eBay determines this price through a machine learned model of the product's sale prices within the last 90 days. What sets us apart from other hard water stain removers?. Use Bring-It-On Cleaner to quickly and easily remove tough hard water stains and mineral deposits from glass, tile, and other hard surfaces. This bottle contains 32 ounces.Bring It On Cleaner is a professional strength cleaner. Use of mounting lubricant is essential for proper mounting of tires. Tire Mount contains no silicone, solvent or soap thus making it safe for use on installation of all tires. Tire Mount also includes a special rust inhibitor to prevent rust on the rim. Ideal for removing stubbornly adhesive dirt contamination, such as paint overspray, water stains, tree sap, adhesive residues and other impurities. The clay suitable for machine processing. SONAXClay disc 150 mm -. The pH neutral formulation makes this product a much safer alternative then Acid-based wheel cleaners and surface contaminant removal. Gliptone's first priority when developing this product was to bring a safe, powerful, and cost effective solution with the lowest degree of odor possible. 3 Rainx Bug and Tar remover. Each bottle is 23fl oz. There are 3 BOTTLES. Auto Wax Tar Grease Remover -1 qt. This Auto Wax Tar Grease Remover by Rustoleum. Auto Wax Tar Grease Remover. Item Wax and Tar Remover. Sanding & Waxing Prep. Auto Wax Tar Grease Remover. Size 1 qt. Work contaminated areas with 3M™ Perfect-It™ III Cleaner Clay using light pressure and the 3M ™ Car Wash Shampoo (or other car wash shampoo) as a lubricant. Repeat as necessary. Wash and rinse vehicle thoroughly using 3M ™ Car Wash Shampoo or other car wash products. Trending at $18.98eBay determines this price through a machine learned model of the product's sale prices within the last 90 days. Application: Simply spray Citrus Power onto the affected area and allow to soak for several minutes. Bug and traffic film remover. Citrus scent. After using Pinnacle GlassWork Water Spot Remover, your glass will be perfectly clear. Using firm pressure, apply Pinnacle GlassWork Water Spot Remover to glass using an overlapping, circular motion. Wizards Bug Release All Surface Bug Remover (22 oz.). Neutralizes acidic bug proteins. It can be hard to keep your vehicle squeaky clean and smooth, but we have your solution! With the ABN Auto Cleaning Clay Bar for Car Detailing, you can remove brake dust, rust, heavy rainwater stains, asphalt, paint overspray, bugs/insects, tree sap, and iron/ferrous powder. CarPro TRIX is a strong degreaser, cleaner, tar remover and iron remover for virtually any exterior automotive surface. 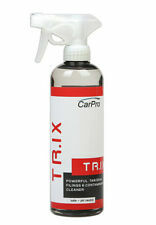 CarPro TRIX Tar and Iron Remover 1 liter. CarPro TRIX is a combination of Iron X plus special chemicals that remove tar and naphtha base components. Bare Slate by The Last Coat is the highest performing clay mitt that money can buy. Iron X by CarPro is an acid-free, pH-balanced iron remover that decontaminates auto paint and wheels. Your vehicle constantly faces unseen threats. Remove them with Iron X! In one step, you can eliminate the cause and its effects. Clay for auto detailing works by floating over the surface you're cleaning on a thin layer of clay lubricant. When the clay encounters surface contamination, it abrasively grinds it away. Detailing clay shears off any foreign material above the level surface of the paint. MFG # T520A. Bug and Tar Remover. EASILY AND EFFECTIVELY REMOVES: BUGS, TAR, BIRD DROPPINGS, TREE SAP. Turtle Wax. One Gallon: BUG REMOVER made by AUTO MAGIC - This product is amazing at removing all kind of insect residue. - Specially formulated for easy removal of bugs and other insects residue. Iosso 10900 Mold And Mildew Stain Remover is color and fabric safe!